Heal Your Puzzle » Blog Archive » Does Christmas Feel Empty? Want it to Feel More Meaningful? Does Christmas Feel Empty? Want it to Feel More Meaningful? I came across a phenomenon this year when I seemed to be very busy with my healing work but not really feeling like I was getting to the bottom of the story… there seemed to be lots of information but it felt empty; there seemed to be no meaning, just lots of words. It reminded me of when I learnt about computer-programming at college… the computer follows instructions step- by-step to achieve a process or an outcome and if they are not written in the correct format, the program will not work or will give erroneous results – the rules of SYNTAX need to be followed. It is also the same for our spoken language; if we speak with words in the wrong order or meaning or in a different language, we will not be understood. 1) the arrangement of words and phrases to create well-formed sentences in a language, “the syntax of English”, a set of rules for a language. 2) the structure of statements in a computer language. 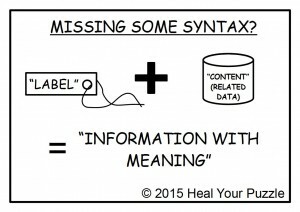 Part of the rules in how our brains understand the World is that a “Label” will identify specific “Content”, so that when you say or hear a Word or Phrase, it will have a Meaning to you. What I found this year is that we can seemingly be functioning fine – we have an inner dialogue processing our lives, responding to circumstances, making decisions and forming responses but you still may feel like something is missing and it may be due to INCOMPLETE SYNTAX. We have a LABEL, a Word such as ‘Christmas’, but there is NO CONTENT – we feel nothing or it does not feel right.